The Stream Of Syrian Refugees Strains Lebanon : The Two-Way More than 8,000 Syrians cross the border into neighboring countries each day. Lebanon has the biggest urban refugee population in the region, and the highest number of unregistered Syrians. The U.N. says despite its best efforts, Syrian refugees in Lebanon can still expect to wait at least four months before receiving help. 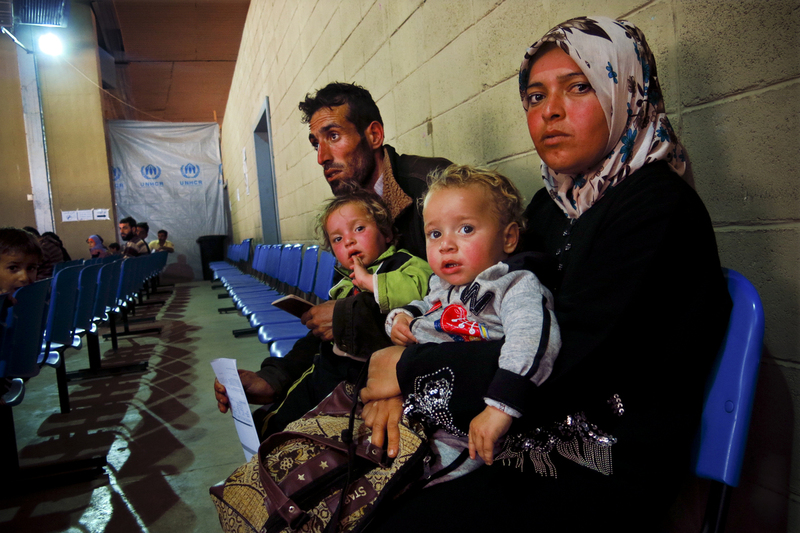 Um Ahmed, her husband, Abu Ahmed, and their two children sit inside a United Nations refugee registration center in Tripoli, Lebanon. They fled the northern Syrian city of Aleppo a month ago. "There was a lot of shelling," said Um Ahmed. "I wasn't thinking. I was just thinking of my children." Um Ahmed holds her infant daughter outside a United Nations registration center for Syrian refugees in Al Mina, a northern Lebanese city near the Syrian border. She is among a group of dozens of Syrians waiting for their names to be called. Um Ahmed tries to coax her screaming infant daughter to take a bottle. The baby is hot — the slight brown curls of her hair are matted to her head with sweat, and the bottle offers no comfort. She keeps crying. She's been here before. "The first time I came they didn't accept us," Um Ahmed says. "They told us I need documents." 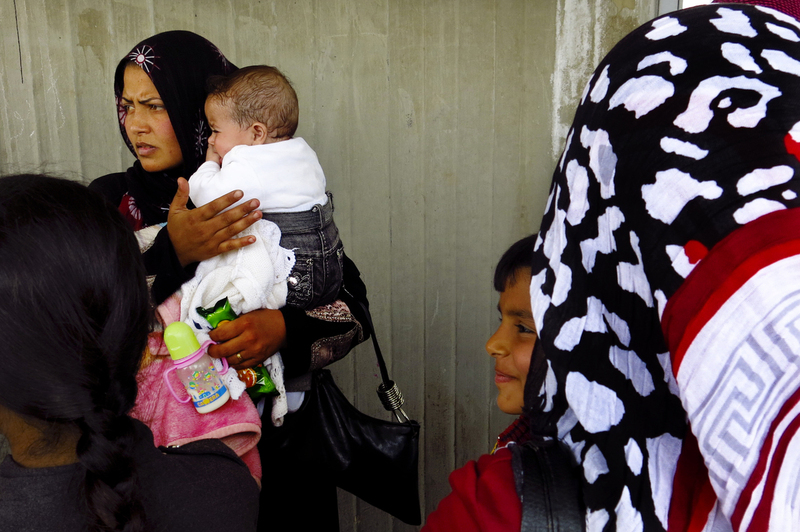 Um Ahmed and her infant daughter wait to register at a U.N. center in the town of Al Mina, in northern Lebanon near the border with Syria. Um Ahmed doesn't have documents. She says it was impossible to get them before she left Syria. Now in Lebanon, she says she has to beg for transportation money just to get to the registration center. The center itself sits about a quarter-mile behind a large black metal gate patrolled by U.N. workers. Um Ahmed flags down a woman wearing a blue U.N. vest. Between the gate's bars, she explains that she missed her latest appointment to register because her child was sick. The woman tells her she'll have to wait another month and a half for a new appointment. "If we let anyone pass without an appointment everyone will expect to," the U.N. employee explains. Um Ahmed tries to object, gesturing to her crying infant. It doesn't work. The Syrian conflict has now entered its third year, with no end in sight. The Syrian National Coalition, the main opposition group, elected its first prime minister Monday, a Syrian-American named Ghassan Hitto. In his first news conference as leader of the interim government in Istanbul on Tuesday, Hitto said creating a stable environment for Syrian refugees to move back to their homes will be a priority. Still, the numbers are staggering — and still growing. 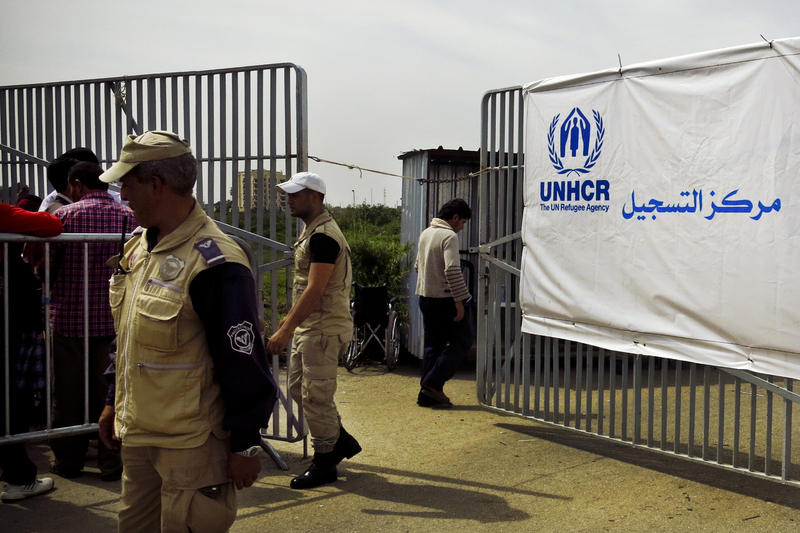 Syrians fleeing their country register with U.N. centers like this one in Al Mina, Lebanon, in order to receive monetary assistance for food and rent, medical care and items like blankets, mattresses and basic kitchen kits. More than 8,000 Syrians cross the border into neighboring countries each day. Lebanon has the biggest urban refugee population in the region, and the highest number of unregistered Syrians, a total of nearly 400,000. The U.N. says employees are working double shifts in its registration centers and it's actively recruiting more, but Syrians who cross into Lebanon can still expect to wait at least 4 months before receiving help. Antonio Guterres, the U.N. high commissioner for refugees, says he hopes the backup will be reduced by June. Lebanon's population has grown by 10 percent since the influx of Syrians began, and Lebanese are growing frustrated with the strain. On a visit to Lebanon last week, Guterres publicly praised the country for keeping its borders open. "Can you imagine what would be the tragedy in Syria if the neighboring countries close the borders?" Guterres said. "We are already witnessing tens of thousands of people killed." Inside another registration center in northern Lebanon, dozens of families sit in rows of blue chairs, waiting, again, for their names to be called. It is calmer inside, and not as hot. A couple sitting in the back of the room, each holding a blonde, curly haired toddler, identify themselves as Um and Abu Ahmed, common names in Syria. They fled the northern city of Aleppo a month ago without a plan. "There was a lot of shelling," Um Ahmed says. "I wasn't thinking. I was just thinking of my children."